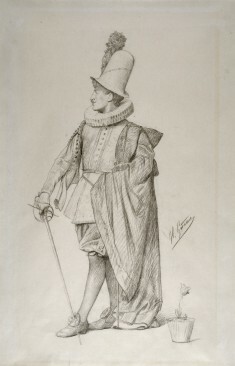 Description Gérôme illustrates an incident during the "tulipomania," or the craze for tulips, that swept the Netherlands and much of Europe during the 17th century. The tulip, originally imported from Turkey in the 16th century, became an increasingly valuable commodity. By 1636/7, tulipomania peaked, and, when the market crashed, speculators were left with as little as 5 percent of their original investments. 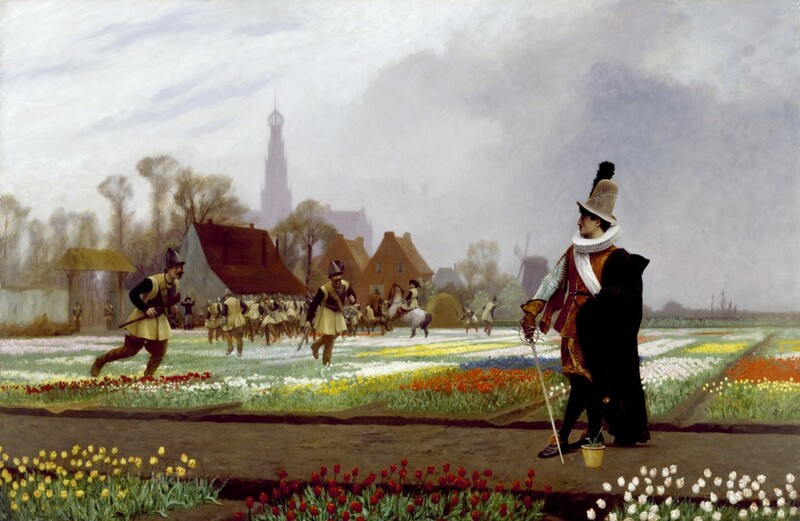 In this scene, a nobleman guards an exceptional bloom as soldiers trample flowerbeds in a vain attempt to stabilize the tulip market by limiting the supply. The Taste of Maryland: Art Collecting in Maryland 1800-1934. The Walters Art Gallery, Baltimore. 1984. Botanical Delights: Floral Motifs in 19th-Century Art. Government House, Annapolis; Strathmore Hall Art Center, North Bethesda; Academy Art Museum, Easton. 1998-1999. 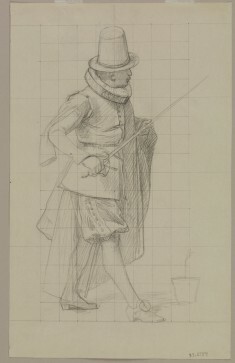 A Discerning Eye: Nineteenth-century Drawings and Watercolors. Academy Art Museum, Easton. 1998-1999. A Magnificent Age: Masterpieces from the Walters Art Museum, Baltimore. The Walters Art Museum, Baltimore; The Nelson-Atkins Museum of Art, Kansas City; Mint Museum of Art, Charlotte. 2002-2004. The Spectacular Art of Jean-Léon Gérôme. J. Paul Getty Museum, Los Angeles; Musee D'Orsay, Paris; Museo Thyssen-Bornemisza, Madrid. 2010-2011. From Rye to Raphael: The Walters Story. The Walters Art Museum, Baltimore. 2014-2016. Provenance Mary J. Morgan; Mary J. Morgan Sale, American Art Association, New York, March 3-15, 1886, no. 156; Hermann Schaus Sale, American Art Galleries, New York, January 15-17, 1912, lot 212 [as "The Tulip Craze"]; Thomas Footer, Cumberland, 1912, by purchase [Mr. J. C. (or G.) Evans as agent]; Mrs. Cephas H. Glass [his daughter], 1923, by gift; Mrs. Cyril Keene, by inheritance; Walters Art Museum, 1983, by bequest.